HomeClinical CasesTreatment of a category II pressure ulcer and improved asymmetric positioning through Vicair. 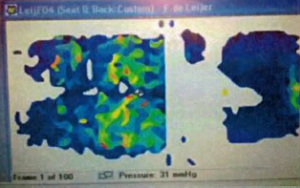 Treatment of a category II pressure ulcer and improved asymmetric positioning through Vicair. Wheelchair users automatically have a high risk of developing skin breakdown. When there are additional positioning aids involved, the risk increases. 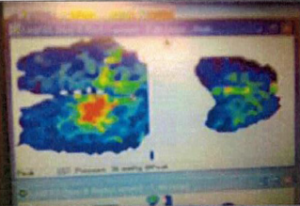 This clinical case describes the treatment of an 8 month old category II pressure ulcer and solving asymmetry for Mr. de L (Spina Bifida patient). Mr. de L is a 73 year old male who generally uses a office chair at home. Outside he uses a manual wheelchair: an active Quicky Argon without arm support that is fitted with a Jay Easy Visco cushion. Mr. de L mainly walks therapeutically and to make transfers, using elbow crutches. Mr. de L. has a sensation disturbance in the buttocks and lower extremities. At the start of the treatment in the Seating Clinic the client suffered from a superficial pressure ulcer, category 2, with wound edge maceration. In general the pressure ulcer does not cause pain. The ulcer does not show signs of shear force or friction. Additionally Mr. de L. experiences pain in the left side of his body at the height of thoracic spinal cord segments 6-8 and in the left side of his torso. Treatment with pain medication has not been sufficient. The pain in his torso occurs after sitting for half an hour: the VAS score varies strongly. Once a week he goes to bed when the pain becomes unbearable and he wants to change his position. Further assessment shows that Mr. de L’s left leg has a different bony structure and size than his right leg. He uses a corrective left shoe because of the shorter left leg. This left leg also has reduced muscle mass. While seated and laying down the abdominal mass is positioned to the left side. He also uses a urine stoma. Once in a while he is faeces incontinent. This did not affect the pressure ulcer. In an attempt to solve the problem at hand it was chosen to conduct pressure mapping of the current situation and of all cushions tested in the process. All pressure maps show pressure on the ischial tuberosities (IT). When using the Jay Easy Visco cushion there is very significant pressure on the left buttock and the centre of gravity of the body shifts to the left. It was found that when using a Vicair cushion that can be setup asymmetrically the pressure is redistributed more equally across the entire surface of the buttocks. The asymmetric setup is accomplished by relatively increasing the height of the cushion’s left side, because there is less buttock/leg mass on this side. After the pressure mapping we chose to try out a cushion that can be adjusted to a asymmetric setup: a Vicair Positioner. By setting up this cushion asymmetrically (more volume on the left side, less volume on the right) the smaller leg/buttock mass is supported and the client experiences improved pelvic stability while seated. This cushion was tried for two weeks. 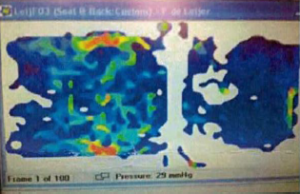 At that point the pressure ulcer had healed, but the client showed more tendency to slide. In order to provide more stability and prevention of sliding we decided to try out a Vicair Active for the next two weeks. The cushion was set up in the following way in order to cater to Mr. de L. asymmetric needs: 7 SmartCells were removed from the cushion’s right rear compartment, 3 SmartCells were added to the left rear compartment and the centre compartment kept its standard filling. A solid seat was installed on top of the wheelchair’s sling seat to prevent it from hammocking. 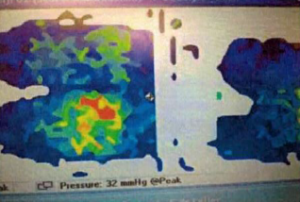 Due to the asymmetric set up, future risk of a pressure ulcer was reduced as the pressure was more equally redistributed on the adjusted Vicair Active. Mr. de L’s pressure ulcer was healed due to the switch to the Vicair Positioner. Afterwards his desired seating positioning and stability were achieved by using the Vicair Active with an asymmetrical set up. He now experiences a high level of seating comfort. Mr de L. has started to stand up and sit down more often. He tries to walk two times a day in a functional manner, for instance in combination with a toilet visit or for transfers. He is more aware of the positive effect of alternating his position. 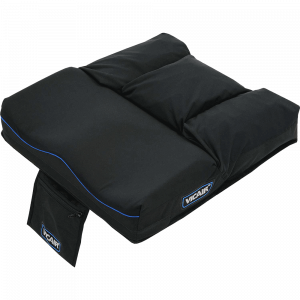 In sum the Vicair Active was able to provide skin protection and it met Mr. de L’s positioning needs for a cushion that provides stability and can be set up asymmetrically. It was however noted that ideally, Mr. de L needed extra back support (lower lumbar and lateral support) and that it was important to improve overall lateral support.